I recently got very interested in Internet marketing and one day my friend Ruslan Abuzant suggested that I register at one of the largest Internet marketing forum – Digital Point Forum (DPF). Later the same day he said that there was this special cool feature that displayed the current music (current track) you were listening to. 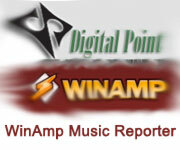 He said that WinAmp was not supported and it would be a pretty interesting thing to write for DPF. So I got the Winamp SDK, played with examples a little and after a few days had the plugin running. At first I thought I'd sell a copy for $5 each but now I decided to give it away for free and even opensource it under GNU GPL license. Here is how the current track that a user listens to is displayed on DPF. Notice the Listening to label. First, download the plugin: catonmat.net/ftp/gen_digitalpoint.dll. Next, put the plugin in C:\Program Files\Winamp\Plugins directory. Step 1: Right click on Winamp. Step 2: Select Options -> Preferences. Step 3: Find Plug-ins section. Step 4: Click on General Purpose label. Enter your DPF username and the special authentication hash that can be found in your Edit Profile link on DPF. You can also specify the track display format. The default format is "%A - %T" which stands for "Artist - Track". The details about how to compile it are in the compile.txt file in the source tree.